Making homemade ravioli is really not as difficult as it seems and the results are outstanding! Once you master a few techniques you’ll never go back to frozen ravioli. From sweet to savory, the filling possibilities are endless. You can literally use any filling you want such as: beef, sausage, mushroom, pear and Gorgonzola, mascarpone and thyme, goat cheese, ricotta cheese, butternut squash, pumpkin, and lobster. A few added ingredients to the dough such as: spinach, tomato paste, saffron, beets, herbs, wine, lemon, and dried porcini will add color and flavor. You can even make Tri-Color Ravioli. This year for Christmas I hope to “upgrade” my pasta maker and then I will definitely try my hand at making tri-color ravioli. 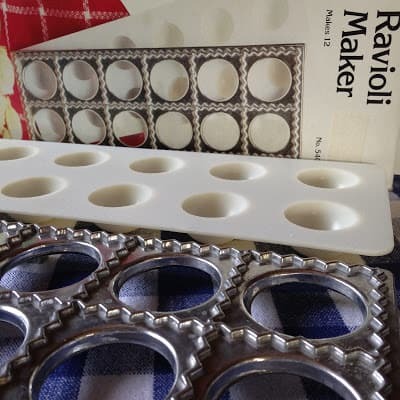 Let’s have some fun and start making Ravioli! Lay a sheet of dough over the metal “cut-and-seal” plate. 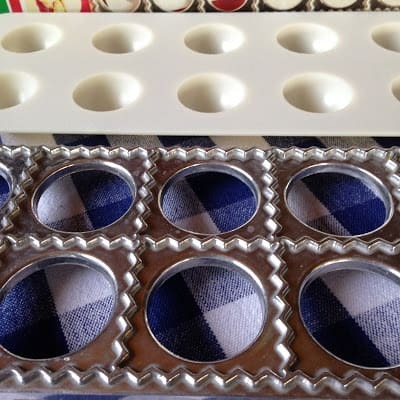 Gently press the 2nd “form plate” on top to create pockets. Fill pockets with your homemade filling. Cover with a second sheet of dough, roll with a rolling pin to separate. Measure flour into a medium bowl, make a well in center, add eggs and water. Beat with a wooden spoon until dough forms a ball and leaves the side of bowl. Turn out onto floured surface, knead until smooth and elastic, 6 to 8 minutes. Divide into quarters, on a lightly floured surface roll one quarter, (keep remaining dough covered with plastic wrap) into a 17 by 13 inch rectangle. Cover with plastic wrap. Roll a second quarter into a 17 by 13 inch rectangle. Cover with plastic wrap. 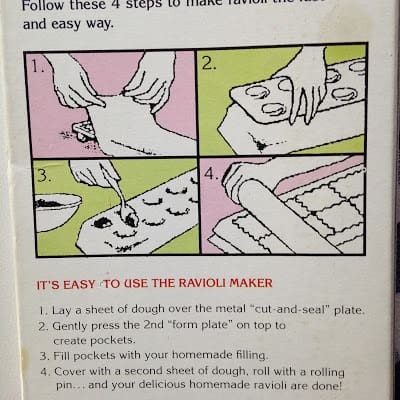 Follow directions below that can be found on the ravioli maker box.